TPO roofing in Denver offers you energy savings, and strong protection for your commercial building. It stands up to hail, leaking, and tearing in the worst Colorado weather. Applied with our expertise, it is the ideal single-ply membrane. You can start saving on energy bills right away. TPO (Thermoplastic Olefin) is a flexible combination of polypropylene and ethylene propylene that is perfect for any flat or low-sloped surface. TPO Roofing DenverWe install ENERGY STAR-rated TPO roofing in Denver. 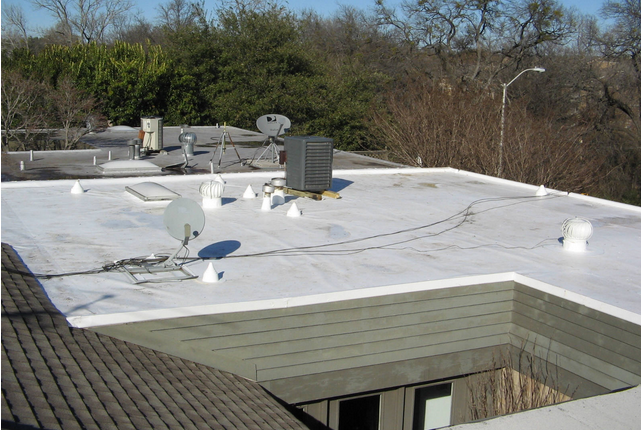 • Your TPO roofing in Denver will be highly resistant to punctures, tears, leaks and fire. You will not have the maintenance headaches that come with less sturdy surfaces. • It is rubber-like, expanding and contracting with building movement and temperature changes. This reduces the risk of cracks and peeling that can occur in other commercial materials. • It is environmentally friendly and energy-efficient, saving you money all year long. TPO roofing in Denver is efficient to install. It is simply rolled out and securely adhered to the decking. The edges are heat-welded at seams and intrusions. For you to fully realize the many benefits, our expert installation is a must. • Proper attachment is essential in windy environments. We are the experienced roof contractor to do your job. Then you will be certain that wind cannot lift the edges. Your operations will be safe, and your contents protected. • You want to combine this single-ply membrane with top of the line insulation. This will keep your building warmer in winter. It also adds a slight slope that eliminates standing water. You’ll have even greater leak protection and a longer useful life cycle. • We have been applying Thermoplastic Olefin since it appeared on the market, and we have been meeting the area’s commercial roofing needs since 1984. The right color, insulation and ballasting can make TPO an energy-saving dynamo all year round. It is an effective Cool Roof, with an initial solar reflectance of at least .70 and an initial thermal emittance of .75. That means that you will see a reduction in both cooling and heating costs. • You can save an estimated $3,500 a year in energy costs, freeing up money in your budget for other priorities. • TPO is both ENERGY STAR compliant and Cool Roof Rating Council certified. Your occupants will feel comfortable all year long – and at a savings to you! • It reflects an average 80 percent of UV radiation – far above the 65 percent minimum required for ENERGY STAR compliance. • A cool surface reduces electrical demand, lessening your carbon footprint. It is an ideal way to show the community you care about the environment. • Your TPO roofing in Denver will be thicker and more reflective than standard rubber roofing, so your HVAC won’t have to work as hard, reducing your maintenance costs. How Long Does Thermoplastic Olefin Last? Manufacturer warranties range from 10 to 20 years. Your results will depend on weather and UV exposure, and how well you maintain your surface. White TPO retains its Cool Roof value best when it is clean, so a regular schedule of washing is all you need to keep it working efficiently. Let us handle that for you. Rely on our knowledgeable team to keep your membrane clean, well-adhered and in top condition. Call now to learn more about why so many commercial facilities are switching to TPO. You will enjoy a flexible surface that is easy to maintain, saves you energy, and creates a lasting barrier against the elements.